Director Sam Raimi admits that he wasn't originally into the idea of having a Stan Lee cameo in Spider-Man. Raimi ended up helming all three installments of the Spider-Man franchise, which starred Tobey Maguire as Peter Parker. The director got his start in the horror genre, and Lee originally approached him about working together in the early 1990s after Raimi made Darkman. At that time, Raimi really wanted to make a Thor movie, but the studio was not interested in making comic book movies in 1991. Attitudes about the comic book movie started to shift by the late 90s, which is when Sam Rami was brought on board for what would become 2002's Spider-Man. Marvel head Avi Arad told Rami that he wanted a Stan Lee cameo in the movie, but the director originally said no. Sam Raimi said, "No. I know Stan, and he can't act." However, Arad kept pushing, and the director finally relented, but added that it was like putting Shakespeare in one of his plays. Sam Raimi now looks back and says that the Stan Lee cameo in Spider-Man is one of his favorite things about the movie. And fans immediately loved it. 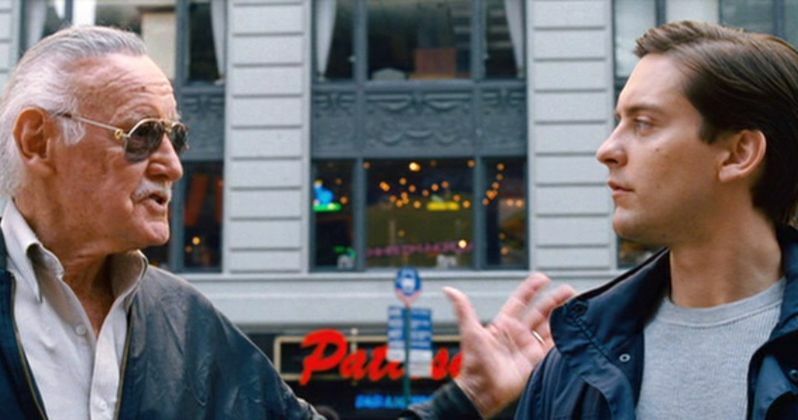 Lee went on to appear in Spider-Man 2 and Spider-Man 3, where he had his longest cameo to date, giving advice to young Peter Parker. Lee says, "You know, I guess one person can make a difference. Nuff said," which has gone on to become one of the comic book legend's best-known lines. Raimi's reluctance at first is understandable, but the Stan Lee cameo has become one of the most anticipated part of any Marvel Cinematic Universe project. Sadly, Stan Lee passed away earlier this week. But, it has been a time of celebration for Marvel fans all over the world, who have been paying tribute to the world that Lee helped to create. Obviously, there is a lot of sadness as well, mainly because we all know that there won't be very many Stan Lee cameos in the future of the MCU. Marvel Studios boss Kevin Feige has teased a few surprises though. We know that Lee will show up in Captain Marvel and Avengers 4, but there's a chance he might even make an appearance in Spider-Man: Far From Home. Now that the Stan Lee cameo in the MCU has come to its end, the studio will more than likely find ways to pay tribute to him in each project that they put out. Whatever that ends up being, it will more than likely be done in a classy way, with maybe even a bit of humor, which is something that Lee would have appreciated. For now, we'll just have to wait and see what the studio decides to do with the upcoming Phase 4 of the MCU. You can read the original interview with Sam Raimi over at The Hollywood Reporter.